According to economists, banks and politicians, we are still in a recession, yet the confectionery segment shows continued growth. NPD has risen year on year since 2007, increasing a staggering 89% with a raft of new brands launched in 2013. 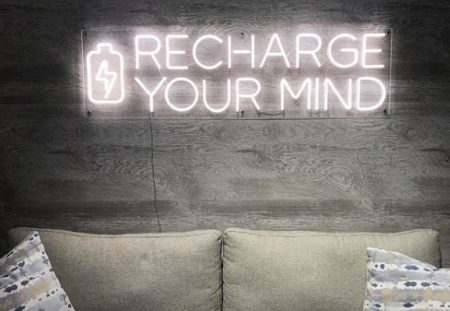 David Rogers, founder and Creative Director of Pure, takes a look at confectionary, factors that may influence growth, market trends and the increasing need for brands to be creative to stand out. Of course, in general there is broader consumer choice today. In the confectionary market this can be seen in the noticeable rise in so called challenger brands that have gained supermarket shelf space. Which may have prompted a backlash with brands such as Cadbury launching new products to claw back consumers. But the large rise in NPD suggests a culmination of influences at work. The recession may well be the main contributing reason for the growth. With less money to spend on new cars, kitchens, or designer clothing, people turn to low value items as a treat. Sweets and chocolates fill that hole. Something consumers can enjoy without having to justify the purchase or balance the household budget. So consumers indulge themselves with chocolates, providing a little escape from today’s economic problems. Another factor may be the increasing accessibility to recently released movies at home, thanks to SkyMovies, and more recent providers such as Netflix. Made ever easier with home media boxes and the introduction of Smart TV. And traditionally people feed the movie-watching experience with confectionary. What do we see within that growth? Some larger companies have adopted a strategy of extending ranges rather than creating something completely new. Which may be a sign of the times as it reduces or negates the need for marketing expenditure to launch products. 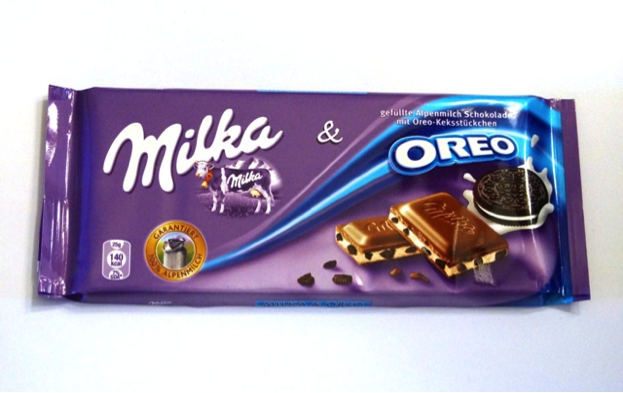 For example, Kraft took its Milka brand and began partnering with other brands they owned, creating products such as Milka with Oreo cookies and Daim. 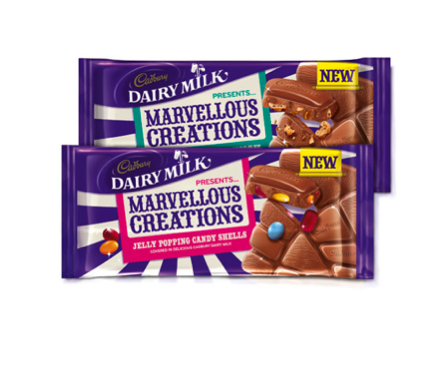 Then Kraft acquired Cadbury back in 2010 and found ways to take the traditional product offer and create something new, such as Marvellous Creations’. From a design perspective the products are presented as traditional Cadbury bars of chocolate dressed up with a hint of ‘carnival’ to reflect the new combinations. The starting point for the design ensures Cadbury will entice a certain percentage of consumers to purchase based on familiarity. And attract new consumers through interesting flavour combinations, with the Jelly Popping Candy Shells creating a memorable taste sensation. 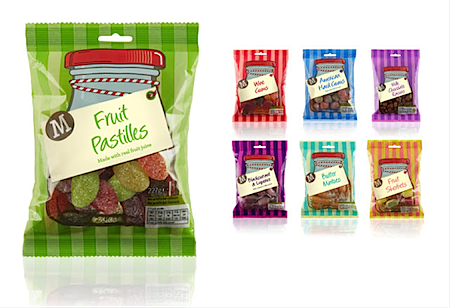 One ubiquitous recent trend in 2013 is to play on associations with the old fashion sweetshop, which evokes memories and feelings of nostalgia, connecting with the consumer emotively. This example for Morrisons is particularly interesting because it uses all the elements that communicate ‘old fashioned sweet shop’ but looks clean and modern. Not falling into the trap of trying to mimic vintage or 1970s in ways that can look end-up with packaging that looks dowdy. The fact that confectionary is such a highly competitive market, combined with our current economic climate where there is little or no advertising spend available, has forced manufacturers to employ increasingly creative thinking, placing greater emphasis on the packaging as a brand tool to engage consumers. 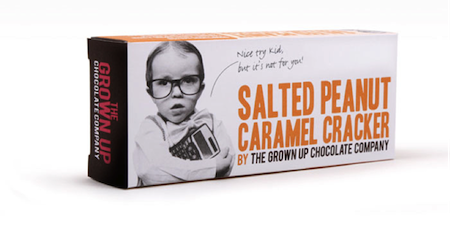 For example, the packaging for ‘The Grown Up Chocolate Company’ employs advertising thinking, presenting a mini ad on pack each time that draws consumers attention to the brand name and brand proposition—for ‘grown ups’ only—and epitomizes how to design for a modern challenger brand, utilizing the packaging to maximize brand notice-ability and recognition. 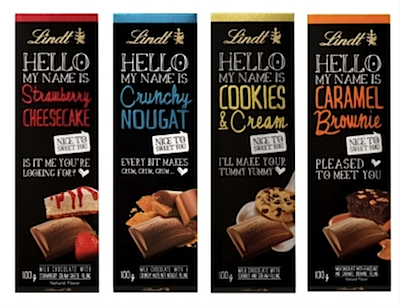 One of the most noticeable launches on the shelf this year was from Lindt, with a chocolate range themed ‘Hello’ that talks directly to the consumer. The text is simple based on statements that begin a conversation and cleverly gives the products instant personality. As Lindt is an established brand, the focus is not on the brand name but differentiating the product range within the brand’s offering, and achieving shelf stand out by developing an instant rapport between the consumer and the chocolates inside. I feel the confectionery market can be viewed as a microcosm for the way the packaging design business is changing, certainly across low value purchases. Where competition is forcing manufacturers to be brave to stand out. 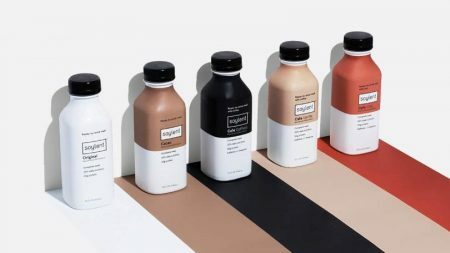 Where we see all the emphasis now placed on the packaging as a brand tool and developing a relationship with the consumer at point of purchase. And if I’m right, 2014 will herald-in even more interesting possibilities and rewarding work for packaging designers—Happy New Year!